Innovations in automotive glass design have resulted in more complex and stringent guidelines for glass shaping (cutting and grinding) and processing (tempering, lamination, bending and add-ons). Customers around the world count on SUPER-CUT for high-performance solutions to their automotive glass fabrication challenges. SUPER-CUT offers a full array of products and services designed to optimize each step of the cold-end glass fabrication process. Through our total system solutions approach, SUPER-CUT will guide you along the path to high-quality, low-cost automotive glass processing with greater productivity. A SUPER-CUT sales engineer will work with you to develop a custom solution for your specific application. Automotive bent glass begins with a flat piece of glass, sized for fabrication. To attain the correct size and shape prior to bending, the glass must be scored and broken out before grinding the edge and drilling. SUPER-CUT offers the most reliable cutting tools for automotive glass fabrication. SUPER-CUT Black Diamond PCD cutting wheels are precision assembled to fit every cutting machine currently on the market. Durable and dependable, our Black Diamond cutting wheels offer the highest cut speed, score quality (reduced flake chips) and longest life available today. Black Diamond cutting wheels solve a variety of production challenges (such as glass thickness breaking out, high compression surface and difficult shapes or edges) while lowering the cost of cutting. We stock wheels in angles of 134°–160° with wheel OD in standard 4.2 mm and 3.0 mm sizes. SUPER-CUT Black Diamond cutting wheels are also a perfect choice for float slitting operations, in the 8.0 mm OD size. For certain glass operations where a PCD cutting wheel is not suitable for short run parts or a particular glass thickness, SUPER-CUT also offers dependable, low-cost carbide cutting wheels. SUPER-CUT carbide cutting wheels are available pre-assembled or as separate components. Our pre-assembled wheel, axle and insert save valuable line operator assembly time, increasing productivity. TIP: A common source of cutting problems occurs when the post on the equipment is not matched to the cutting wheel. Always make sure you are using the correct post for a perfect fit in your cutting. SUPER-CUT diamond pencil edging wheels set the industry standard for automotive glass processing. SUPER-CUT diamond grinding wheels provide the highest edge quality, fastest line speed and longest life while retaining the profile shape for greater yields. Our lean manufacturing process and value stream controls ensure consistent and reliable wheel performance in standard applications and with high-speed grinding up to 40M/min. Do you want to eliminate startup issues? Ask your Sales Engineer for a profile custom designed for your application to improve startup and edge quality. Or consider the SUPER-CUT PE wheel with our Quick Start profile service. While pencil edging is the norm in automotive glass, some customers may request a basket shape. No problem. SUPER-CUT offers most of the popular basket shape profiles or can custom-design one for you. We also have a special split-mesh diamond bond specification that is perfect for the basket shape profile. SUPER-CUT diamond and metal bonds provide the best wear rates in the industry. Our bonds hold the profile shape, giving you long, high-quality production runs. With SUPER-CUT, you’ll increase the number of redress in each wheel and lower your cost significantly. Let SUPER-CUT custom design the glass profile for a superior ground edge, quick startup and high oven yields. SUPER-CUT grinding wheels are available in a variety of profiles, including waterfall, T-grind, J-grind, offset profiles and more. SUPER-CUT also offers special diamond/bond specifications and profiles for a seamed edge. New SUPER-CUT Smart Wheels with an integrated Radio Frequency Identification (RFID) tag offer the ultimate in data, inventory tracking and accumulation for today’s glass processing applications. Our Smart Wheels easily integrate into your operation and support customization with writable memory, eliminating errors from typos and preventing plant downtime. SUPER-CUT will restore your diamond wheel to its original condition at one of our 14 global redress centers using our NC Electrode Discharge Machining (EDM) process. We also offer special Quick Start wheel profiling for high-speed grinding with immediate startup and no ramp up to produce a high-quality glass. Find out more about our Wheel and Drill Reprofiling services. SUPER-CUT offers a variety of drills that are custom engineered to your application and ready within two to four weeks. Our one-piece straight core drills offer fast performance and amazing life, in sizes from 4 mm to 180 mm OD. In sizes under 25 mm, SUPER-CUT core drills have been known to drill more than 40,000 holes. SUPER-CUT can fit any drilling machine on the market today. Shank design will be selected to fit your equipment. SUPER-CUT’s one-piece chamfer drills are designed to drill and chamfer holes in a single cycle. The fixed core lengths are set for each glass thickness to provide optimum drill speed and hole quality. The one-piece core drill seamer is the most commonly used drill in automotive glass today due to its ease of use and excellent hole quality, resulting in high glass yields in the tempering process. Consult a SUPER-CUT sales engineer for a size and specification recommendation. SUPER-CUT’s two-piece drill design allows you to match a core drill of your choice to the seamer, so the same OD drill can be used for multiple glass thicknesses. The seamer is precision designed for a tight fit to maintain hole quality. While the two-piece drill bit combo offers greater flexibility, it requires more in-house control by plant personnel during setup. Shanks are available for any glass drilling machine: Bystronic, Bando, TAC, Forvet, Bentler, Schiatti, ADA, Glassline, SunTool, Intermac and more. For special or custom machines, SUPER-CUT can design a shank for your specific application. To keep your diamond wheels and drills performing at their best, SUPER-CUT offers a full line of aluminum oxide dressing sticks. Our dressing sticks reduce wear and increase the life of the tooling for optimal glass edge quality. Available in a variety of sizes to meet your needs, SUPER-CUT dressing sticks come in thicknesses of 2.6 mm and up. Thin sticks are also available, but due to their fragile nature and high breakage rate they are not recommended. We also offer longer sticks in 230 mm lengths for hand-dress applications. Your SUPER-CUT sales engineer will recommend an aluminum oxide dressing stick that best meets your equipment and process needs. Most sticks are in stock and available for immediate shipment. If you are dressing more than one stroke or have to dress more frequently than every 15 pieces, review your cut size and contact your SUPER-CUT sales engineer for assistance. Drills are the most difficult diamond tools to dress properly and keep running consistently. The solution? SUPER-CUT’s specially specified Drill Dressing Stick. Formulated with the perfect abrasive combination to aggressively expose diamond drill bits and keep them exposed, our Pink Drill Dressing Stick can help you save time and money in your glass drilling operation. TIP: Always make sure the stick is centered in your auto-dresser. Sticks out of level will lead to scrap on the glass part you are grinding or scrap the grinding wheel. Be sure to use a stick thicker than the glass. Many customers have success in using a 3 mm stick for all laminated glass thicknesses. A 5 mm dressing stick often can be used for 3 to 5 mm glass. SUPER-CUT offers a variety of leading coolant products with chemistries specially designed to complement our diamond wheels and drills. We offer everything you need to keep your glass process running smoothly — from complete cooling system management to coolants and lubricant additives. Cutting oil is used to score automotive glass for breakout. The oil fills the score and prevents the glass from re-healing, allowing a clean, defect-free separation of the glass part from the cullet trim. Careful use of cutting oil is required to ensure compatibility with take-away belts and seals in the cutting equipment. Using the wrong oil will create a fire hazard in your plant. Since the oil is washed into the coolant system, take care that the cutting oil does not become a contaminant in your grinding coolant or glass washer. 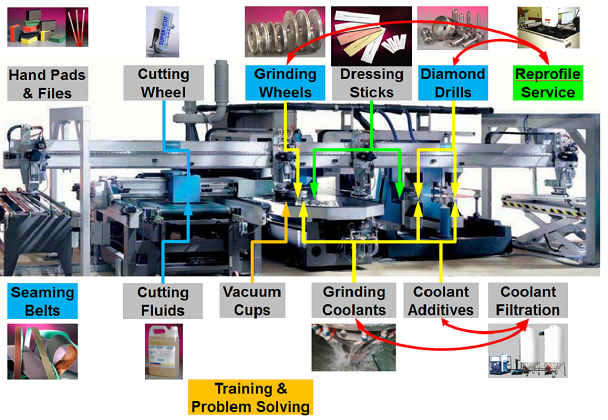 Ask your SUPER-CUT sales engineer to help you select the perfect cutting oil to meet your glass cutting needs. Years of R&D development have generated significant new synthetic coolant products for automotive glass operations. Coolant is designed as a one-part system used primarily in centrifuge systems, or a two-part system with a secondary flocculant additive for settling systems. We also offer a full line of additives, including flocculants, coagulants, defoamers, rust inhibitors and bactericides. Your SUPER-CUT sales engineer can evaluate your glass grinding process and recommend the best coolant for your operation. SUPER-CUT offers a variety of belts for seaming glass edges in your specified width and length. A SUPER-CUT sales engineer is available to help you select the proper belt for your glass seaming process. For glass applications that require only a seamed edge, SUPER-CUT offers low-cost silicon carbide or aluminum oxide conventional seaming belts. All belts have backers designed for glass that can be wet or dry seamed and are perfect for hand-seaming glass. Norax® belts offer a fast cycle, high-quality smooth seam edge for improved oven yields. The belt backer is so tough it can even be used in automated or robotic seaming. Longer belt life could make this the most economical product for your plant. Norax is a more flexible belt and well suited for difficult shapes with a sharp radius or the deep scallops found in today’s automotive glass. Norax belts eliminate the variable grind of conventional belts and provide a more consistent finish. For the highest edge quality and seaming, SUPER-CUT offers diamond seaming belts. With a seam equal to a diamond grinding wheel, our diamond belts feature a ground edge that delivers the highest oven yields possible with seamed glass. SUPER-CUT diamond belts are the toughest belts available for the most extreme robotic seaming applications. Choose from a variety of diamond meshes and dot or arrow patterns. SUPER-CUT’s diamond hand files and pads are the perfect tools for repairing small chips and shiners in the ground edge of glass, helping minor imperfections to blend in seamlessly. Our standard diamond hand file is in stock for immediate delivery. We also offer custom-designed diamond hand files as well as oval or round hand files to repair chips around a drilled hole. SUPER-CUT hand files are ideal for trimming plastic extrusions for add-ons to the glass. SUPER-CUT diamond hand pads are lightweight and easy to use. Our hand pads are available in multiple grits and dot or arrow patterns. SUPER-CUT supplies PVB deletion belts in a variety of flexible backers and fine abrasive mesh for safe removal of PVB beads in laminated automotive glass applications, including windshields, sidelites, sunroofs and backlites. Contact your SUPER-CUT sales engineer for samples and a spec suggestion suited to your process. Learn how our PVB deletion belts protect the edge of the glass and operators from injury. Coated glass is used in automotive applications for its solar control features. Fabrication of coated glass often requires edge removal of the coating without harming the glass. Available in 6”, 10” and 20” OD sizes, SUPER-CUT edge deletion wheels safely remove this coating while preserving the integrity of the glass. Polishing glass is as old as glass itself. Today’s automotive glass fabricators are faced with the challenge of polishing glass edges with a thin polish at high speeds. SUPER-CUT offers a polish wheel that produces the best edge available on automotive glass. It’s stocked in standard widths of ½”, ¾” and 1” and wheel OD sizes of 6”, 8” and 12”. Custom widths are also available. TIP: Polishing glass is a wet application. The quality of the polish depends on the quality of the grind. Best results occur with a two-wheel coarse grind, followed by a fine grind. For a one-wheel grind and polish, ask your SUPER-CUT sales engineer for a recommendation. Just like automotive glass fabricators, SUPER-CUT uses quick-change wheel arbors in our manufacturing process. The difference is SUPER-CUT makes our own arbors. We manufacture standard and custom arbors for quick mounting of grinding wheels, with run-out specs from +0.000–0.005 mm. SUPER-CUT arbors are hardened for wear resistance and precision balanced. Learn more about our Replacement Tooling for Wheel Arbors. SUPER-CUT offers standard vacuum cups as economical replacements on your vacuum table. Ask your SUPER-CUT sales engineer about available options.